What a treat to fly instead of drive the many miles to Colorado. 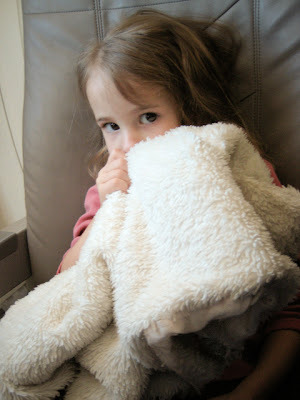 This was Daisy's first trip in an airplane in her memory, and she behaved like a very grown-up girl (aside from the blankie). She wore her backpack without stopping and was very glad to have her own fold-down tray. Giles didn't need a blankie to relax. Because of uber-generous family, we got to stay in a palatial house instead of cramped quarters. Giles had his own *floor*. Everyone had their own bathroom. Daisy was still sleeping in my space, though. That felt cramped. We found ourselves astonished by the snow. Of course we had expected it, but we'd never *lived* it in such magnitude. Incredible beauty! And so cold! But sort of undaunted, we headed out to ski, some of us three times a day, as the slopes are lighted at night. I'll just mention here that I did *not* go skiing in the dark, as I can barely see at night, and I can barely ski. 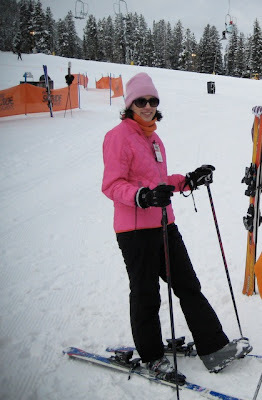 In fact, this photo is of my very first moment on skis, at my lesson. 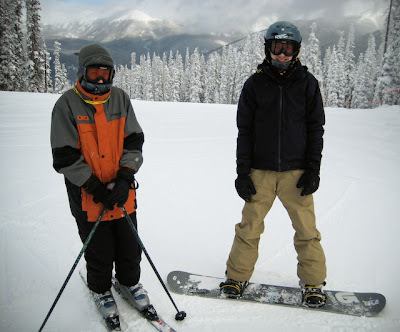 I did learn to ski, but I did not learn how to be not afraid while skiing down a mountain! However, Clara was not afraid! All the kids are good skiers. Felix is a great skier. Giles, as you see, stuck with the snowboard. And a helmet, after the first day. I still can't believe we would all go out to play in such cold. I mean, we're from the South! 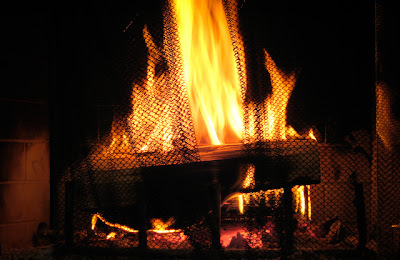 Good thing about the fireplace and the massive pile of firewood. 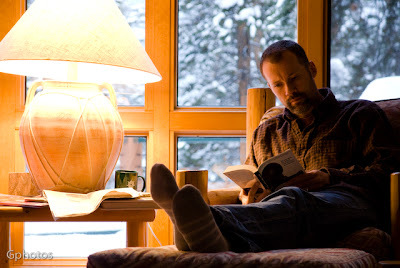 Our inside time was grandly cosy, with beautiful views out every window. 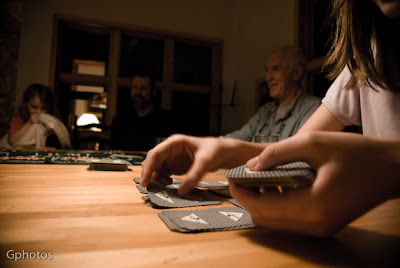 Card games to play with grandparents. 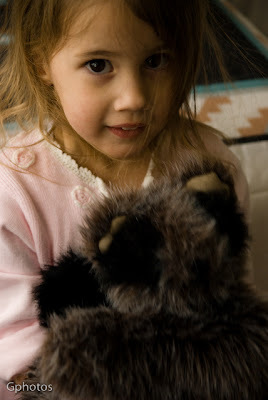 Stuffed animals to play with in the lamplight. And something nice to knit! On our way home, everyone a little tired. . . But not too tired to knit. Now, mountains of skiwear to launder, blue skies to walk under, an empty fridge to fill. Schoolwork to start back up, a new semester for Giles. New fabric to share . . . .
Oh that looks delightful! I cant tell you how jealous I am! How do you all know how to ski when you're from the south. Im only abouot a half hurs drive from Mt Hood and I have no idea how to ski! Gorgeous photos. Looks like such a wonderful family time! What a nice family trip. 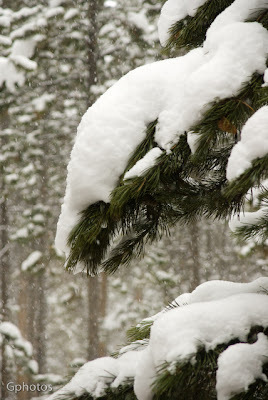 We love our snow and skiing here in the East! i was looking forward to seeing your pics from your vacation...i really enjoyed seeing them it look like you all had fun i know what you mean about coming back to do the laundry and fill the fridge!! Thank you as always for sharing your pics. What a lovely trip, Anna. Welcome Home!!! what a wonderful time away. It looked really pleasant and the pictures were beautiful. This kept making me smile. My dad is from the South, and I remember him working in the garden in sixty-degree April weather wearing a t-shirt, under a flannel shirt, under a big winter coat. I love skiing; glad to see you had a great vacation. Thank you for sharing your wonderful trip! Makes me remember our Colorado years so fondly! Looks like a great time was had by all. My in-laws live in Denver and for awhile one set lived in Breckenridge. We loved all our trips out there. 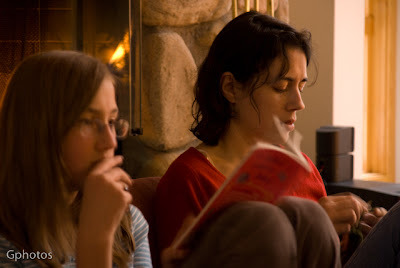 This trip of yours reminded me of our trip to Crested Butte - lovely. 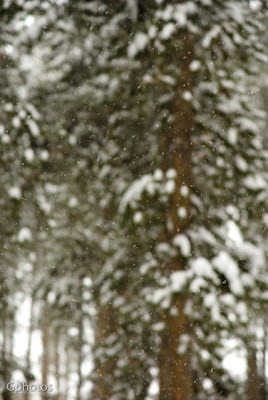 I enjoy skiing, but haven't done much since the arrival of kiddos. You all do look cold, though. We haven't been to Colorado for awhile, but when we do go, we go in warmer weather. We got tired of bringing home colds! The wildflowers are beautiful out there in the spring and summer. Have fun settling back in. Oh - wanted to let you know I spent the last few weeks reading through all your old posts and enjoying them very much. Schoolhouse Coffee Cake is now a favorite around here! Welcome back! 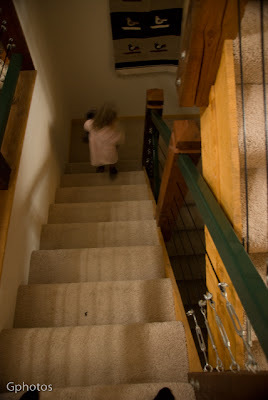 It was cold without the lights on at PleasantView schoolhouse blog. 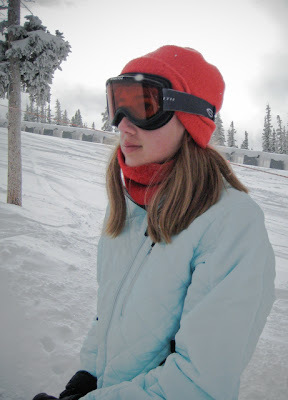 My daughter started ski lessons this week, too, but our mountains are tiny compared to the Rockies. can't wait to see your fabrics. Thank you for sharing the photos from your trip. 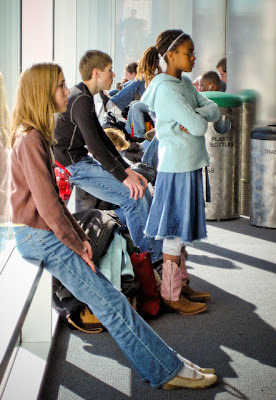 We were praying for your travel and for you all to have an excellent time, (love Bella's boots). Thank you for encouraging me through your blog to step out of my comfort zone and: love my family better, sew for my family, sew for others, cook more simply and welcome many into our home through teas, snacks and meals. I sure would love to see the finished knitting projects and I bet quite a few others that visit here would too! 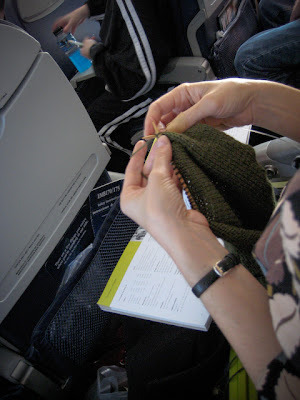 You could knit on the plane? I thought that wasn't allowed. These photographs are a treat! Wow! What a wonderful way to spend a couple of weeks. I am NOT a skier (spent most of my one day skiing lying on my back going what felt like 80 miles an hour downhill) but I am with Giles on the snowboarding. I'm so glad you're back, that your mother is doing well and that everyone had a good time on the slopes. When will we get to see what you were knitting so furiously?? Thanks for sharing the photos. I too would like to know about how you got knitting needles through security, let alone on the plane. Wow! I had no idea knitting needles were an issue! In fact, I know I've specifically read that they're allowed. They were bamboo circular needles. Have other people had their needles taken away? Looks like an absolutely lovely trip. Welcome back, and thanks for sharing! Re: Knitting needles on airplanes. I was also curious so I checked the TSA website just now under "Know Before You Go" and Knitting Needles have a "yes" in both the carry-on and checked items areas. Woo hoo! Did they let you knit on the plane? 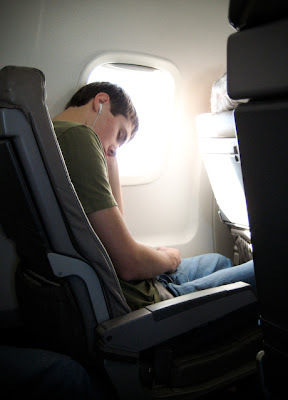 On one flight we were on several years ago (after 9/11), the flight attendants took a woman's needles from her (thankfully she got them back once we landed)...but wondering if they changed that? I haven't attempted to bring knitting, as I thought it wasn't allowed? Looking close, it appears you're a continental knitter too? How did I ever abide flying before I learned to knit - great way to pass that air time.